c.1350 – Edward III gives the Cross of Gneth, said to be a piece of the true cross, to St George’s where it becomes its most famous relic. 1350-57 – New buildings, north of the Chapel, completed for the Dean and Canons. Works carried out to fit Henry III’s 13th century Chapel for use by the College and the Order of the Garter. 1351 – The Pope grants the College of St George exemption from the Archbishop of Canterbury and the Bishop of Salisbury in whose diocese Windsor lay. 1352 – Constitution and composition of the College is established including the Choir and the Poor Knights (now known as the Military Knights). Henry V (1413-1422) 1415 – Common hall for the priest-vicars built. Part of this two-storied building now houses the College Archives and Chapter Library. Edward IV (1471-1483) 1475 – Edward IV commissions the building of a new Chapel for St George’s, which will also be his place of burial. 1478-81 – The Horseshoe Cloister, surrounded by small two-storied houses, is built at the west end of St George’s Chapel to house the priest-vicars. These houses are now inhabited by the lay clerks, or gentlemen of the choir. 1481 – The bones of Master John Schorn are brought to Windsor from North Marston. So great is his reputation as a healer that pilgrims travel from all over England to visit his shrine, in the south-east corner of St George’s Chapel. 1477-83 – The Quire and its aisles are built and roofed (but without the vault). Work on the stalls in the Quire also begins and is completed by 1484. 1483 – Edward IV dies at the Palace of Westminster. His body is brought to Windsor for burial in the north east corner of the Chapel, below his chantry chapel. 1483 – The Nave is started in 1483 and completed by 1509. The Quire vault is also built. Richard III (1483-1485) 1484 – The body of Henry VI is brought to St George’s from Chertsey Abbey by Richard III. His tomb becomes another focus of pilgrimage. Henry VII (1485-1509) c.1500 – Chapel built for Oliver King outside the South Transept. Facing King’s chapel is the Panel of Kings which depicts Prince Edward, eldest son of Henry VI; Edward IV; Edward V and Henry VII. 1503 – Sir Reginald Bray dies and is buried in his chantry chapel in the South Transept. Bray gives large sums in his will for completing the Nave of St George’s Chapel. c.1506 – The West Window is completed, and glazed, the 4th largest window in Britain. It contains seventy-five figures of popes, kings, princes and saints. Henry VIII (1509-1547) 1510s – The Chantry Chapel of Edward IV is adapted by Henry VIII as a royal pew, by adding the oriel window for the use of his first wife Catherine of Aragon at Garter ceremonies. 1522 – The Chantry Chapels are completed. 1528 – The Chapel is finally completed after the building of the fan vault over the crossing. 1534 – Henry VIII breaks with Rome and becomes head of the Church. 1537 – Queen Jane Seymour dies and is buried in a vault beneath the Quire. Edward VI (1547-1553) 1547 – Henry VIII dies, and is buried in the Chapel. In his will Henry VIII directs ‘that our body be buried and interred in the quire of our Colleg of Windsor, midway between the stalls and the high alter, with the body of my true and loving Queen Jane’. 1547-8 – Stone altars are removed from the Chapel, but unlike elsewhere, chantries are not abolished under Edward VI. Elizabeth I (1558-1603) 1559 – Re-foundation of the Poor Knights by Elizabeth I.
James I (1603-1625) ©The Royal Collection1607 – James I commissions John Norden’s bird’s-eye views of the Royal Parks etc., including one of the Castle with great detail of the College buildings. 1642 – Windsor Castle becomes a Parliamentary stronghold and the Dean, Dr Christopher Wren, and Canons are removed from the College as the Civil War rages. Continuity is maintained by the Poor Knights of Windsor, but the Castle is largely used by a garrison, and as a prison. 1649 – King Charles I is executed. His burial in the Chapel causes controversy and he is interred in a vacant space alongside Henry VIII and the grave is left unmarked. Charles II (1660-1685) 1660-1670 – Charles II orders the restoration of the College after much destruction in the Castle in the 1650s. 1682 – Sir Christopher Wren completes a detailed survey of the Chapel for the Dean and Canons. He had left the Deanery as a 10-year-old in 1642. George III (1760-1820) 1785 – Henry Emlyn begins restoration works including an organ-screen made of Coade stone designed to carry a large new organ built by Samuel Green of Isleworth (paid for by George III). 1789 – While re-paving in the North Quire Aisle a vault is discovered that contains the remains of Edward IV and his wife Elizabeth Woodville. A black marble slab with brass letters is placed to mark the vault. The Nave and aisles are re-paved and the ledgers and floor memorials re-positioned. 1804-1810 – The making of the huge royal vault below the ‘Tomb House’ (former Lady Chapel). 1813 – In the presence of the Prince Regent (the future George IV) what is thought to be the burial vault of King Charles I is opened. By command of William IV, in 1837 a black memorial slab inscribed with the names of Henry VIII, Jane Seymour and Charles I is inserted to mark the vault. George IV (1820-1830) 1824 – Following the birth of a stillborn child and the subsequent death of Princess Charlotte in 1817, a large memorial for her is created in the Urswick Chapel. Victoria (1837-1901) 1841-2 – Thomas Willement restores and rearranges the historic glass of the West Window, providing six additional figures of his own design. Willement’s association with St George’s continues until 1861 as he adds other glazing in Chapel. 1859 – Denton’s Commons, the former common house for chantry priests and choristers, using parts of the former Great Chamber of Henry II and Henry III, is demolished. The area is remodelled and 13th century fragments of the Great Chamber survive within the present No.25, including the roof trusses, fireplace and chimney and fragments of wall paintings. 1863-73 – George Gilbert Scott is commissioned to create the Albert Memorial Chapel within the former Lady Chapel. Knighted in 1872, Scott also undertakes major restoration works across the College and has a significant impact on what we see today. 1871 – A full flight of ceremonialsteps is completed to the West Door replacing the rough mound which had been unsuitable for ceremonial purpose after the Horseshoe Cloister was restored. 1893 – St George’s School is established in its present location of Travers College, once the home of the Naval Knights of Windsor. George V (1910-1936) 1911 – The first Garter service since the reign of George III is held following the investiture of the Prince of Wales (later Edward VIII). 1920-30 – Sir Harold Brakspear undertakes major restoration works to secure the future of the Chapel buildings, particularly the underpinning of the foundations and rebuilding of the vaults. New King’s Beasts are also erected. 1929 – The West Window glass is restored again and rearranged to great acclaim. 1930 – The Great Organ is rebuilt and the pipes separated into two flanking sections opening up the full view of the Quire pendant vaults. George VI (1936-1952) 1940 – Many of the fine stained glass windows are removed and stored in the Curfew Tower to prevent damage during World War II. ©Royal Collection1948 – King George VI revives the annual Garter Installation and Thanksgiving service with full ceremonial investiture. This revival coincides with the 600th anniversary of the founding of the Order. opened by HM The Queen. 2002 – Following her death, Queen Elizabeth The Queen Mother is interred with her husband King George VI. Princess Margaret’s ashes are also interred at the same time. 2004 – The major restoration of St George’s Chapel and associated buildings commences. 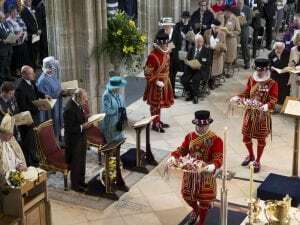 2008 – HM The Queen and HRH Prince Phillip attend the thanksgiving service. The service recognises the efforts of all those who have contributed to the first phase of restoration works. 2016 – Royal Maundy Service is held in the Chapel for the first time since 1959.